Oh, olden times—you so crazy. The modern subway might be a perfectly functional way to get around a big city, but you can't help but feel a little disappointed that inventor George Bennie's hanging Railplane didn't catch on as a more exciting alternative. 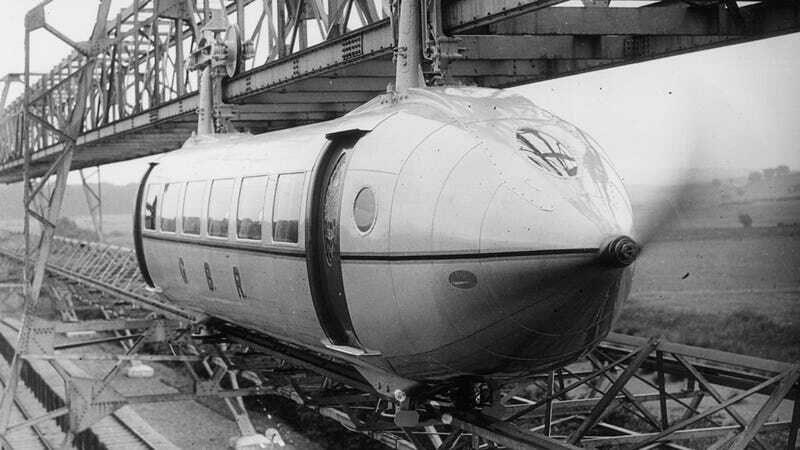 Unveiled in 1930, the Railplane technically wasn't a monorail since it used both an overhead rail to hang from, and a guide rail underneath it. So duorail is maybe a better description. Like the underground subway, the Railplane was designed to operate away from traffic on busy surface streets, but by running above roads and cities instead. And as it caught on, its growing infrastructure of rails would have been used by both passenger and cargo trains. The most unique aspect of the Railplane, and the reason it was named that in the first place, was its use of an airplane propeller for propulsion. Which today just seems like an all-around terrible idea because it would have been incredibly loud, and terribly dangerous as the cars passed through each station. So it's not surprising that the Railplane's creator was bankrupt by 1937, and the 130-yard prototype line that had been built in Glasgow, Scotland, was torn down in the 1950s for scrap metal.